EMLA will be closed the week of April 26 for a late Spring Break and our annual client retreat. 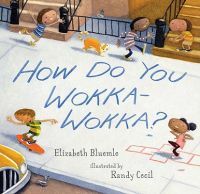 We've had lots of bursts of good news around here lately as various award lists start to come together for 2010—starting with Elizabeth Bluemle's How Do You Wokka-Wokka?, which won the 2010 Please Touch Museum's Annual Book Award, chosen by kids! This year, the kids doing the choosing were from Philadelphia's Overbrook School for the Blind. The award will be presented later this month at the museum. Way fun! EMLA authors have not one but two books represented on the Michigan Great Lakes Great Books nomination list in the 4th-5th grade category: Chris Barton's The Day-Glo Brothers and Ruth McNally Barshaw's Ellie McDoodle: New Kid in School. This is a kids' choice award, as well. The Day-Glo Brothers is also on the ballot for the 2010-2011 Maine Student Book Award, along with Laura Resau's The Indigo Notebook and Lewis Harris's A Taste for Red. We're loving M-states around here this week! The Indigo Notebook is also one of three finalists for the 2010 Colorado Book Award in the Young Adult Literature category. The award recognizes Colorado authors, editors, illustrators, and photographers, and Laura's What the Moon Saw won in this category back in 2006, and Red Glass in 2007! Finally, C.J. Omololu's Dirty Little Secrets is on the latest update of the 2011 YALSA Quick Picks for Reluctant Young Adult Readers nomination list from the young adult librarian division of the ALA. This list honors high-interest books that will sustain a reader's attention easily—and believe me, does this book ever keep your attention! A whole chorus of congratulations for Ruth McNally Barshaw, who's been a magnet for good news lately! Not only is her latest Ellie McDoodle book slated for release this summer (see the just-finished cover, above! ), but the first two Ellie books, Have Pen Will Travel and New Kid in School will soon be available in South Korea! Publisher Jangsoohanulso will release them in the next 18 months. We can't wait to see how these unique "sketch-journals" look in a different language! If that's not enough, New Kid in School is one of eight titles nominated for the 4th and 5th grade category of the 2010-2011 Great Lakes Great Books Award, chosen by readers in Ruth's home state of Michigan. Congratulations, Ruth! Eric Pinder has signed a deal with Little, Brown Books for Young Readers for his picture book text that speculates what fun and chaos would occur If All of the Animals Came Inside. The acquiring editors are Lauren Hodge and Liza Baker. As if this weren't exciting enough, the picture book, slated for Spring 2012, will be illustrated by the legendary Marc Brown, creator of the Arthur books and TV series! This deal has been in the works for some time, and we are very excited to be able to announce it officially. Congratulations, Eric! I am so pleased to announce that Susan Vaught, author of Trigger and My Big Fat Manifesto, among others, has a new untitled novel underway with Bloomsbury! In the new story, seventeen-year-old Del faces his coming adulthood with a felony on his record that will shape the rest of his life, all because of a mutually consenting "sexting" incident with his girlfriend three years earlier. Susan does such an amazing job of capturing the voices of teens in crisis (I dare you to try to get Trigger's Jersey Hatch out of your mind after reading that one), and Del is no exception. One fun fact is that Del has a parrot who plays a crucial role in the story, and Susan herself has a parrot who often keeps her company while she's writing. The acquiring editor at Bloomsbury is Margaret Miller. Congratulations, Susan! The busy season continues—almost daily, boxes of new books and galleys are arriving in the office. It's like Christmas in April! "In the mid-1980s, 13-year-old Sadie Brooks and her younger, tantrum-prone sister, Zuzu, arrive at their new house in Salt Lake City with their father and pregnant stepmother. Kristin (aka Belladonna Desolation, or Bella) lives with her demanding mother and feels like an 'extra'–a child her mother didn’t want. She and Sadie become close while investigating the possibilities of ghosts in the nearby graveyard. When the girls find a crawl space in Sadie’s attic, they are amazed to also discover a doorway with the words 'Palace Beautiful' painted over it. Inside the small space is a journal, and when Zuzu bursts in at the same moment they find it, the team of two becomes a gang of three. They take turns reading the diary, which dates from 1918 and was written by a girl named Helen White. She describes the very room in which the three girls are sitting; her family, including a baby brother who is not expected to survive; and the town’s battle with deadly influenza. The children decide to try to track Helen down, and their heartfelt quest results in an unforgettably sweet conclusion. Williams does a super job with the characters in this beautifully written book, and it is satisfying to see how they develop."